With the declining yen, Japan's manufacturing PMI has risen eight months. In contrast, China has been wavering near the stagnation line since early 2011. Trade war questions relate to the just-released PMI reports and also the 4th quarter US GDP report. Let's start with today's PMI releases on China and Japan. 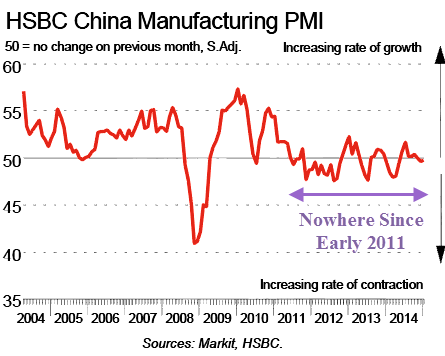 The HSBC China Manufacturing PMI shows Chinese Operating Conditions Deteriorate Fractionally in January. Chinese manufacturers saw a fractional deterioration in operating conditions at the start of 2015. Although output rose slightly and new orders broadly stabilised, staffing levels were cut for the fifteenth successive month. Meanwhile, relatively subdued client demand led companies to reduce their stock holdings of both post and pre-production goods in January. On the costs front, lower raw material prices led to the steepest reduction in average input costs since March 2009, which contributed to a sharp decline in prices charged. After adjusting for seasonal factors, the HSBC Purchasing Managers’ Index™ (PMI™) posted at 49.7 in January, down slightly from the earlier flash reading (49.8), but up fractionally from 49.6 in December. This signalled a second successive monthly deterioration in the health of the sector, albeit only slight. Latest data indicated a renewed expansion of Chinese manufacturing output in January, though the rate of increase was only fractional. This was the first time that production has risen in three months. Manufacturing companies reduced their headcounts again in January. That said, the rate of job shedding was the weakest recorded in 15 months and only slight. China's manufacturing PMI has been flirting just above and just below the stagnation line since early 2011. More time has been spent in contraction than expansion in that period. 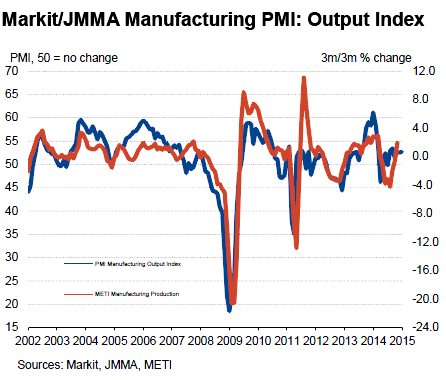 In contrast to China, the Markit/JMMA Japan Manufacturing PMI shows solid production growth at start of 2015. Data at the start of 2015 signalled a solid improvement in operating conditions in the Japanese manufacturing sector. Production growth continued for the sixth month running, supported by a further rise in new orders. Subsequently, payroll numbers remained in growth territory, with the latest expansion broadly in-line with the previous month. Meanwhile, upward pressures on both input and output prices remained. The headline PMI posted at 52.2 in January, little changed from 52.0 in December and above the 50.0 no-change mark for the eight month running, thereby signalling sustained growth in the Japanese manufacturing sector at the start of 2015. Panellists attributed the latest increase to a combination of improved advertising, stronger demand conditions and the launching of new products. Similarly, new orders from abroad rose in January. How long will China let Japan debase the Yen without a response? How long before US manufacturers whine about loss of exports? Will exports add to or subtract from US GDP next quarter? Will the US economy decouple from the global economy? 1A. China will not let Japan (and increasingly Europe) get the upper hand forever. China will soon take strong action to reduce the value of the yuan. 2A. Manufacturers will start whining loudly if they are not already. Expect to see currency manipulation charges in the news again soon. Those charges will escalate as soon as China responds to Bank of Japan and ECB moves to reduce the value of the yen and euro. 3A. Subtract. Not only are US exports getting more expensive relative to Europe and Japan, the entire rest of the global economy is slowing rapidly. 4A. No. The US will not decouple as economists assume. I addressed questions three and four in more detail in my Saturday, January 31 post: Diving Into the GDP Report - Some Ominous Trends - Yellen Yap - Decoupling or Not? There's much more analysis of autos, imports, inventories, and other US GDP factors in the above link, including a discussion of US recession possibilities. Please give it a look if you missed it.